Negativity is nothing but an emotion that brings the worst out of any situation or the person. The virus of negativity spreads due to the negative attitude or outlook of the person. Our ancestors were so true when they said that “one bad apple could spoil the entire barrel”. One negative employee can turn the healthy working atmosphere of the workplace into a chaotic, unhealthy, and negative organization. Does it mean that you are completely finished, the second you come across a negative personality? If that is what you think then you are entirely incorrect. There is always a way (at times, various ways) to overcome this negative atmosphere and win over it through positive outlook. One should definitely fight and win like a warrior against the trap of negativity. In the corporate sector, we observe a diverse range of employees. This diversity brings along different mindsets that affects the environment. Thus, it is very essential for the employers to stop that negative attitudes in the workplace. This positive approach should start from the early stage itself. Let us see how to control the negativity thread from the beginning. Dealing with any type of problem, you need a good defence strategy against the negative factor. Preparing strategies to eradicate the roots of negative attitudes in the workplace is the utmost need of the employer. The biggest negative attitudes in the workplace is initiated by the lack of communication and its resultant rumors. Rumors are a set of baseless information spread among the people. This information has innumerable editing and exaggeration. Thus, they are capable of trapping the entire atmosphere of the workplace. To prevent this, one needs to stick to the open door policy. What does open door policy mean? Open door policy is an indirect right to information policy, which connects the employees with an authoritative person. This not only helps them to gather the correct information regarding the company’s in(s) and outs but also enables them to get the necessary guidance and knowledge from the authority. Gossiping and complaining is always one of the problems that accelerate the negative attitudes in the workplace atmosphere. This further leads to a disruptive environment, which is not healthy to work. However, what if I tell you that there is a very simple solution to this problem? Listening is very important when it comes to dealing with problems like these. As an employer or a manager, one needs to tackle these problems with active interest in the issues at hand. This increases the satisfactory level of the employees. This in a longer run can help in conquering the wall of negativity. In addition, do not boss around. Even if you are the employer, you do not own your employees. Treat them good and encourage them to work better. At the same time, do not forget to appreciate their efforts. Moreover, whenever you achieve anything include your employees in the gratitude speech as the success is purely based on the fair contribution of each employee. No matter what you do, you cannot change the thought process and mindset of anyone. However, you cannot totally neglect the effect of the diverse thinking in the same platform. This is the reason why we opt for various policies in the company. Therefore, the employees are expected to follow these policies. However, we do have an exception here. Not everyone likes or enjoys the office policies. Policies are subject to protest from the workplace unit. That again can be dealt without encouraging negative behavior. Workplace means the place you work. Therefore, the evaluation of the employees should be based on their work performance. One can simply emphasize on the expected behavior of the policies and work things out from the beginning of the problem. Employees are the assets of the company. Their work and behavior drives the company and its atmosphere. Thus, it is very important for the company to hire the right individuals for the work. Employees that are wonderful in both the departments i.e. work and behavior, contribute to a healthy and positive working environment. • On a scale of 1-10 what rank would you give to your past working experiences and why? • How would you describe the management, staff, employer and manager of your previous job and why? • If given a chance what things would you like to change from your previous job. These Questions Very Cleverly Give an Insight of the Person. Therefore, employers should consider these points in order to tackle the problems of negativity from the company. You can also create strategies while keeping in mind the above points. A successful company is not simply a company with good performance instead, a successful company is the one that satisfies and makes everyone happy. It is indeed true that negativity is contagious. Thus, it is important to check for any negative influence or encouragement that occurs within the company grounds, through the management or the rotten apple. Therefore, make some strategies to tackle both the aspects of the company. How would you do it? Positivity is the soul of any place. The second you are near a positive area; you get the good vibes and vice versa in the negative ones. Thus, for a good and healthy working environment, positive thoughts, behavior and vibes play a pivotal role. However, the question is that how would you encourage this positivity when the employees feel negative towards something? Well, you need to set up an example in order to motivate positive minds. Positive comments can work wonders, especially when employees need it. Make sure to underline the importance of positive outlook to any upcoming challenge or target. This approach not only boosts the confidence of the employees but also encourages positivity in the workplace. For example, when an employee mumbles as “I can’t do it”; you instantly will have to encourage him or her by saying something like “Give it a try and you might be surprised at what wonders you can do”. Of course, the employees are talented and perform fabulously alone. However, it is equally important to work properly in team. Working in team requires patience and leadership skills. Thus, the policies that you create should also cover the part that emphasize on positive and good behavior. In addition, they should be informed well about their evaluation based on their interpersonal skills. When people are aware about their work evaluation expectation, they tend to be more positive. This is because they know that their hard work may go in vain if they behaved in a wrong way. Make collaboration and cooperation the main element of the workplace and see the change in the attitude, atmosphere, behavior and performance. What type of family does not fight once? Usual fights and problems also arise between siblings. Similarly, office or the workplace is the place where the office family lives for about 6-7 hours a day. It is a common thing for two workers to have problem occasionally. However, when you start an open door policy, workers will often deposit their problems on your shoulder. Letting them know whether their solution is correct is very important. In addition, encourage them to indulge in problem-solving discussion. This will not only lessen the complaints but also boost the positive environment. Attention is the main reason people pull innumerable stunts. In the corporate sector, often employees try to grab the attention of employer. This at times helps them to let people know about their position or whatsoever. However, why would you do the same mistake i.e. entertain the negative ones, like most of the employers? When the negative attitudes in the workplace is not rewarded with enough attention, people tend to try something different. Slowly and gradually they will stop being negative. In addition, if you keep entertaining the negative outlook people, gradually the positive ones will feel neglected. As a result, things will start getting out of hands. Thus, remember to attend the right people. Express your appreciation to employees who promote a good working environment. Appreciation and recognition are the two reasons for which people work hard. However, it is not possible for everyone to aim for the bull’s-eye all the time. Constructive criticism plays a pivotal role in improving the performance level of the employees. As a result, it increases the succession chances. When you fail your employee by not appreciating his hard work or by continuously giving negative comeback, your employee will gradually be stuck between the negative spirals. Therefore, it is important to not only provide constructive comebacks and appreciation but also encourage and motivate them to work hard. This will surely boost the positive element in the work environment. This is the best way to tackle any problem without involving or creating any kind of problems. This can be a best ground for both the employee and employers to understand the problems of the workplace or between the employees. This will also make the atmosphere less tense as the first step of problem solving i.e. identifying the problem is completed. This is the best way to turn the negative attitudes in the workplace atmosphere into positive again. However, it is impossible to go on with a collective approach. At times, you also need to tackle problems individually. Thus, you need a few strategies to tackle individual employee behavioral issues. The best way to tackle the employee’s problem is to letting him or her know that you are aware of the negative impact he or she is having on everyone else. This will help him or her to come up with the reason behind the constant negative behavior. As a result, it will be easier to search for a solution. For example, tell him or her about how the constant negative attitudes in the workplace has created trouble for him or her with the co-workers. Moreover, he or she might have to work more due to this behavior, as no one might help him or her due to the negative attitude. Not all problems arise due to a negative outlook. At times, the reason might be something unexpected or unnatural. Thus, it is very important to know all the point of views. For example, if an employee appears saying he or she is facing problems due to someone but what if that someone might not be at fault and this is just another technique to grab attention and create trouble? This might boost negative atmosphere. Thus, it is essential to know the story from all the aspects and views. Moreover, also let everyone know that if their claim is wrong or untrue, they themselves might get in trouble and face dire consequences. The best way to keep the situation in control is by letting everyone know about the consequences of any negative attitudes in the workplace. Discipline is the utmost need of any organization. Thus, by putting out the expected discipline standards, you not only set a bar but also indirectly expect positive vibes from everyone. 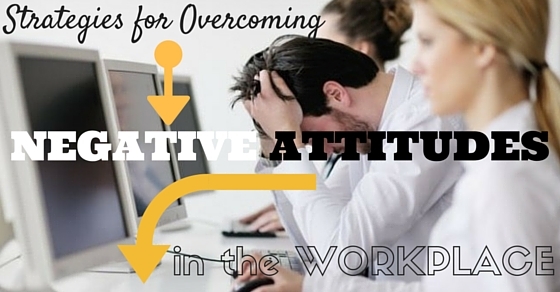 Therefore, we can conclude that negative attitudes in the workplace can only be conquered with positive attitude. Thus, encourage positive attitude and enjoy the positive environment in the workplace.